or Athens…or Alexandria…or Jerusalem for that matter? The folks at our west coast Ivy, Stanford University, came up with one of the most interesting solutions to this problem. Meet ORBIS: The Stanford Geospatial Model of the Roman World. In layman’s terms, meet the Google Maps of the Roman Empire. ORBIS was designed by a team of historians, classicists and IT specialists. 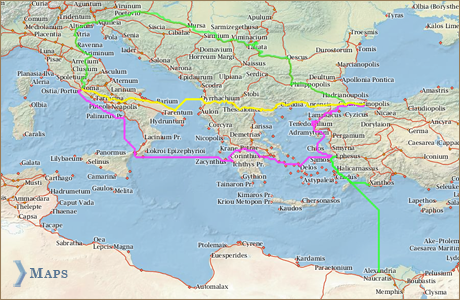 Walter Scheidel, a Roman historian in the Classics and History departments, painstakingly mapped out roads, routes, sea lanes, settlements, obstacles, mountain passes, and anything else used for transportation in the Roman world. His research further helped calculate distances, travel times, travel costs, adjustments for wind currents, altitude, population…just about anything you need to travel around 200 CE. With IT experts Elijah Meeks, Karl Grossner and Naomi Alvarez, Scheidel and company created a model that calculates time and cost for various transportation routes throughout the Empire. According to their website, ORBIS uses about 751 sites (cities, towns and prominent landmarks), of which 268 are sea ports. There are 84,631 kilometers (52,587 miles) of roads and desert tracks, 28,272 kilometers (17,567 miles) of navigable rivers and canals, as well as 900 sea routes which averages a total distance of 180,033 kilometers (111,864 miles). Never mind all that. I had loads of fun playing with the ORBIS mapping application. One of the tabs is Mapping ORBIS, which allows someone to map a distance between Roman settlements using various forms of transportation. For example, to travel from Rome to Londinium (today’s London) in January, on foot or on riverboat, would take about 41.8 days covering 2436 kilometers. It also gives shipping and travel costs in denarii, or Roman currency, per kilogram of wheat by donkey (25.53), by wagon (31.46), or per passenger in a carriage (a whopping 1624.24). ORBIS even provides the settlements where you stop along the way. I cannot wait to use ORBIS in my class when the Ancient Rome unit gets around. This application is an incredible tool for the classroom, especially for students that still cannot get around the complexities of travel in the ancient world. ORBIS provides, using the most accurate research, a first-hand look at travel in the Third Century CE. Please let me know how you’re doing with it…and make sure to tell them the Neighborhood sent you. Enjoy.